Julie Andrews was born on 1st October, 1935 in Walton on Thames, Surrey, England. She was brought up in humble surroundings. At a young age, her parents were divorced and she was brought up by her father, her mother (Barbara) and step father, Ted Andrews. One of her earliest memories is living through the blitz, sheltering in air raid shelter’s. It is said that during the air raids, Ted Andrews, would often start singing, Julie would also join in singing a full octave above everyone else. This was the first time her beautiful singing voice was noticed, and her parents took care to nurture and improve her voice in her childhood years. Amongst her teachers was the famous concert soprano and voice instructor Madame Lillian Stiles-Allen. Andrews later revealed that Madame Lillian Stiles-Allen ” had an enormous influence on me,” Andrews said that the relationship was almost like that of mother and daughter. Julie Andrews first experiences of performing came in 1945, at the age of only 10. She was invited to join her mother and “pop” (her step father Ted) on stage. She remembers how she had to step on to a crate to reach the microphone. Her first big single performance came on 22 October 1947, when she performed at the London Hippodrome. She performed the testing “Je Suis Titania” aria from Mignon. This difficult piece was from part of a musical revue called “Starlight Roof”. From this point her progress was swift; in the next year, aged only 13, Julie Andrews, became the youngest person to perform in a Royal Command Variety Performance. 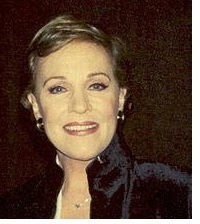 Between 1950-52, Julie Andrews made her break into the fledgling TV programs, gaining national prominence through her appearances in the show “Educating Archie”.